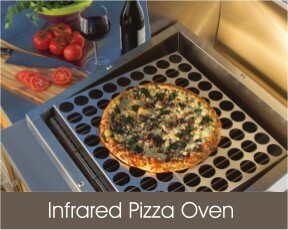 Purchase a TEC Infrared Pizza Rack for your TEC Patio FR and turn your grill into an infrared pizza oven. The infrared heat makes pizza crust crisp but does not dry out. The 304 stainless steel, infrared rack raises the cooking surface of the pizza above the grates to slow down the cooking process so that the crust and top of the pizza cook evenly. The large open area of the perforated cooking surface allows the maximum amount of infrared heat to reach the crust, making the outside of the crust crisp while keeping the inside and toppings moist.